July 26 | 5:30-7 p.m. Presentation starts at 5:30 pm. Improving Cloverdale Road between Franklin Road and Camas Drive in coordination with the Idaho Transportation Department as they replace the Cloverdale overpass. Please join us for this early peek at the document, which will be published in early August for public comment and considered by the ACHD Commission for adoption on August 22, 2018. The initial draft and Information about the FY 2019-2023 Integrated Five-Year Work Plan (IFYWP) is available. We welcome your thoughts and comments! If you cannot attend the meeting you are welcome to testify at the Commission hearing in August or to send comments in advance. 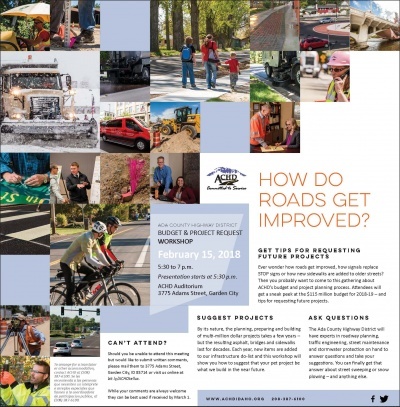 Ever wonder how roads get improved, how signals replace STOP signs or how new sidewalks are added to older streets? By its nature, the planning, preparing and building of multi-million dollar projects takes a few years -- but the resulting asphalt, bridges and sidewalks last for decades. Each year, new items are added to our infrastructure do-list. Citizens will have many opportunities to get involved and make requests in coming months before the ACHD Commission considers the spending plan for adoption in late August. ACHD starts the budget process early to allow citizens a chance to impact the process, if not for the coming year then for a year or two down the road, so to speak. The first open house for the Fiscal 2019 Budget was held on February 15, 2018. Another public workshop will occur in July. The public is welcome to testify at the Commission hearing in August or to send comments in advance.